20 CD/DVD Capacity. 2 overlapping layers to save space. 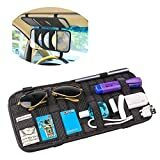 Simple and effective organiser to carry your cables / sunglasses / flash disk / credit card / Stationery and other essential items. Easily folded up and secured with two Hook and Loop fastening tapes. Adjustable Elastic Straps fit most vehicle visors and can be easily detached using buckles on the straps. Made of high quality fabric – environmentally friendly, yet durable. Feels soft and smooth – resists wear.